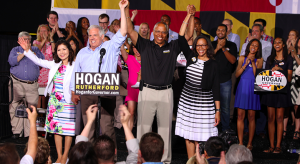 We spend the second hour in a State News Roundup, including a discussion around Governor-Elect Hogan’s transition and upcoming administration. With: Greg Kline, attorney, co-founder and Contributing Editor for Red Maryland, who hosts the Conservative Refugee podcast and co-hosts Red Maryland Radio; former Democratic Gubernatorial Candidate Delegate Heather Mizeur (District 20 Montgomery County); former Democratic Candidate for Attorney General Delegate Aisha Braveboy (District 25 Prince George’s County); Rev. Dr. Todd Yeary, Senior Pastor at Douglas Memorial Community Church in Baltimore; Roberto Alejandro, Reporter for the AFRO-American Newspapers; and Josh Kurtz, blogger at CenterMaryland.org and Editor of Environment & Energy Daily.